With over 323 million people living in America, there’s no doubt that we are a huge country. A huge country however has equally huge energy requirements! Whether its lighting up streets to powering our buildings, energy is crucial to our day to day lives. But how does America generate its energy? 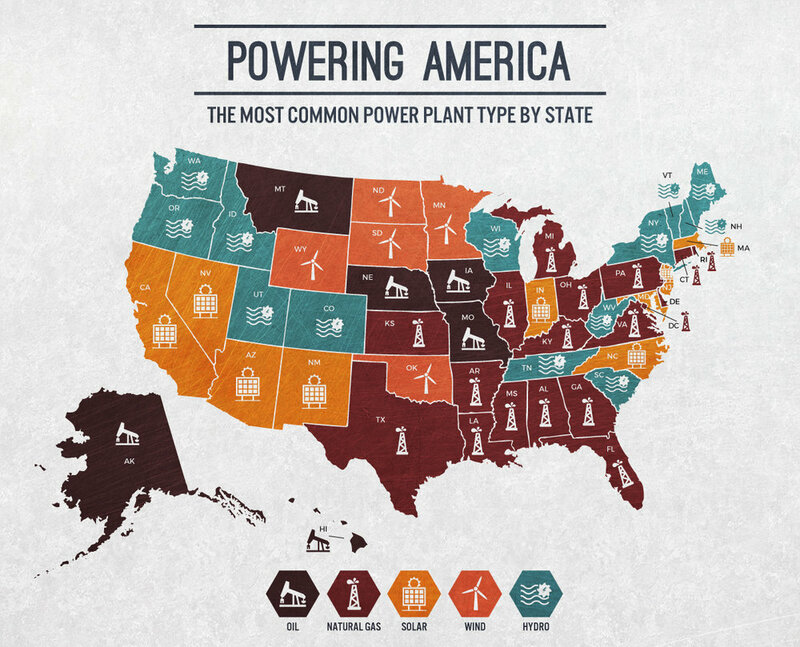 What are the most common power plant types per state? Which states generate and consume the most energy? And how has our energy production changed over the years? At Crescent Electric we wanted to find out so we analyzed power plants and energy trends across America to answer these questions. The most common US energy sources by state. Overall natural gas is the most popular power plant type across America with these plants being the majority power plant type in 16 states. Coming in second are hydroelectric plants with 13 states using these types of plants the most. It’s no surprise that in the sunny west coast states solar power plants reign supreme and America seems to be saying goodbye to oil also with oil fueled power plants being the least popular with only five states having them as the majority power plant type. The Top 10 states for US energy consumption and US energy production. When it comes to energy production Texas generates the most producing a whopping 18,130 trillion btu per capita. We aren’t quite sure what’s happening in Louisiana though with them being the number one consumer of power across America, perhaps it’s all the lights that need to be lit for Mardis Gras? Energy production by US energy sources. Looking at energy production trends we can see that coal, natural gas, and nuclear power plants account for the majority of energy production across America however there’s a steady decline in coal powered plant energy production since 2007 whereas nuclear energy production has remained steady. Solar energy usage as a US energy source over time. It’s great to see the rise in solar energy production with a sharp rise since 2011 and we hope power plants taking advantage of this green energy source continue to rise across America. So there you have it, natural gas power plants are the most popular across America and also produce the most energy, solar power is on the rise, and we owe a big thank you to Texas for generating the most power for the country.